As electricity returns and highways reopen, some Northeast residents tried to get back to their weekday routines Monday following the massive snowstorm that had millions digging out from New York to Maine. But the routine for other New Englanders was disrupted by school and workplace closings, and poor road conditions. For some there's also a new worry: the danger of roof collapses as rain and warmer weather melts snow. The storm that slammed into the region with up to 3 feet of snow was blamed for at least 15 deaths in the Northeast and Canada, and brought some of the highest accumulations ever recorded. Still, coastal areas were largely spared catastrophic damage despite being lashed by strong waves and hurricane-force wind gusts at the height of the storm. Most major highways were clear on Monday, though a 14-mile stretch of Interstate 91 from just north of Hartford to the Massachusetts line closed in both directions for more than an hour because of icy conditions, NBC Connecticut reported. An ambulance flipped on its side on Interstate 95, and those transported to a hospital afterward were expected to be okay, police told NBC Connecticut. Many secondary roads still had a thick coating of snow, and high snow banks that blocked sight lines at intersections and near highway ramps, making turning and merging hazardous. "It was definitely a struggle to get here," said Dana Osterling, 24, who lives in Leverett in western Massachusetts but commutes to Boston twice a week to attend Berklee College of Music. "I live on a dirt road so the plows don't visit us very often," she said at a service plaza in Natick on the Massachusetts Turnpike. She and her six housemates shoveled for about three hours straight to free their cars Sunday. Around the region, parking spots were filled with snow and many two lane roads were down to one. Fernando Colon, 48, of South Windsor, Conn., was driving to work Monday morning in heavy sleet on a two-lane highway that was down to one lane because of high snow banks. "This is awful," he said as he stopped to pump gas during his trek. Snow banks were piled high on the unusually quiet streets of downtown Hartford, where the big insurance firms encouraged people to work from home Monday. In Fairfield, Conn., Mary Elizabeth Anderson said she couldn't go to her job as a marketing director Monday because her street had not been plowed yet. She said the town told her streets that normally take about 10 minutes to plow were taking close to an hour. "You have to be patient," Anderson said. "I'm sure they're doing the best they can. It's a huge undertaking." The only path on the road was what a neighbor did with a snow blower, she said. Hundreds of people, their homes without heat or electricity, were forced to take refuge in emergency shelters set up in schools or other places. But by early Monday, outages had dropped to about 130,000 — more than 110,000 of them in Massachusetts. Driving bans were lifted and flights resumed at major airports in the region that had closed during the storm. Public transit schedules were being restored. Aurea Santiago of Shrewsbury drove into work at a Boston bank. The worst part was the side roads, she said. "A couple of the lanes are pretty narrow," she said. "If you get in the wrong lane it's pretty dicey." The Boston-area public transportation system, which shut down on Friday afternoon, resumed full service on Monday — but told commuters to expect delays. The Metro-North Railroad resumed most train service on its New York and Connecticut routes while the Long Island Rail Road said commuters could expect a nearly normal schedule. On New York's Long Island, Samantha Cuomo was stressed out as her 40-minute commute to work turned into two hours Monday. She called the roads "an absolute mess." Cuomo, of Bay Shore, is a manager at a group home and said the street near her work hadn't been plowed and trees were down. "That's what people pay tax money for," she said. 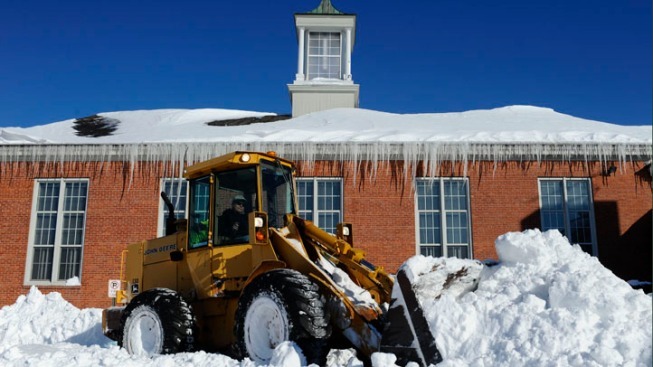 Some public school systems canceled classes on Monday, including in Boston, Providence and on Long Island, while local governments in some areas told non-essential workers to take the day off. Long Island was slammed with as much as 30 inches of snow, which shut down roads, including the Long Island Expressway, where many people had been stranded overnight during the worst of the storm. A 27-mile stretch of the road was closed Sunday but the roadway reopened Monday in time for the morning commute, NBC 4 New York reported. Gov. Andrew Cuomo said more than a third of all the state's snow-removal equipment was sent to the area, including more than 400 plow trucks and more than 100 snowblowers, loaders and backhoes. "The massive amount of snow left behind effectively shut down the entire region," Cuomo said. Utility crews, some brought in from as far away as Georgia, Oklahoma and Quebec, raced to restore power. By early Monday, about 130,000 customers still had no electricity — down from 650,000 in eight states at the height of the storm. 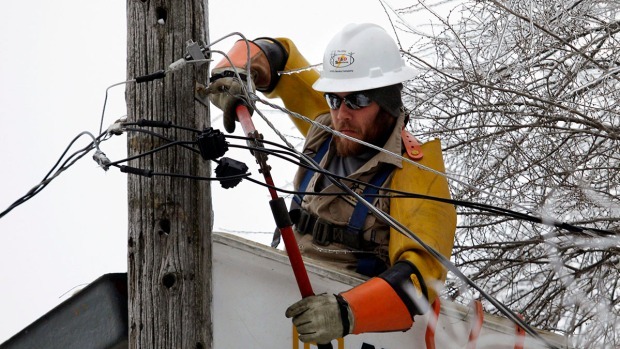 In hardest-hit Massachusetts, officials said some of the outages might linger until Tuesday. Boston recorded 24.9 inches of snow, making it the fifth-largest storm in the city since records were kept. The city was appealing to the state and private contractors for more front-end loaders and other heavy equipment to clear snow piles that were clogging residential streets. Massachusetts Gov. Deval Patrick was visiting Monday with officials in some of the coastal towns hardest hit by the storm, including Scituate and Marshfield. He called the amount of debris and rocks tossed onto waterfront roads "extraordinary." The National Weather Service was forecasting rain and warmer temperatures in the region on Monday — which could begin melting some snow but also add considerable weight to snow already piled on roofs, posing the danger of collapse. Of greatest concern were flat or gently-sloped roofs and officials said people should try to clear them — but only if they could do so safely. "We don't recommend that people, unless they're young and experienced, go up on roofs," said Peter Judge, spokesman for the Massachusetts Emergency Management Agency. Officials also continued to warn of carbon monoxide dangers in the wake of the storm. In Boston, two people died Saturday after being overcome by carbon monoxide while sitting in running cars, including a teenager who went into the family car to stay warm while his father shoveled snow. The boy's name was not made public. In a third incident, two children were hospitalized but expected to recover. A fire department spokesman said in each case, the tailpipes of the cars were clogged by snow. In Webster, a 60-year-old off-duty member of the Worcester Fire Department also died Saturday after suffering a heart attack while clearing snow at his home. In Maine, the Penobscot County Sheriff's office said it recovered the body of a 75-year-old man who died after the pickup he was driving struck a tree and plunged into the Penobscot River during the storm. Investigators said Gerald Crommett apparently became disoriented while driving in the blinding snow. Christopher Mahood, 23, of Germantown, N.Y., died after his tractor went off his driveway while he was plowing snow Friday night and rolled down a 15-foot embankment.